After spending a ton of time in State of Decay’s Breakdown mode, I’ve come to just absolutely love the game and can’t wait for State of Decay 2 this year. Having said that, it isn’t perfect by any stretch of the imagination. It reeks of a limited budget, but one that was used to create a competent game. With Microsofts full backing this time around and 3 to 4 years of development time, developer Undead Labs should have had more than enough time to craft their ultimate zombie survival game. This is what I want to see from the sequel. As I mentioned, State of Decay definitely came off as a game with a limited budget to work with. Supposedly the developers at one point did have a working weather system, for the DLC I believe, but since I haven’t played Lifeline, I can’t say for certain if it made the cut. Considering no one talks about it I assume not. One aspect of a good zombie game is its atmosphere. I love when it feels tense, like a zombie could appear at any moment and ambush while I’m searching through a house. I get goosebumps every time, I make sure to lock the door, that sort of thing. What can further enhance that feeling is if it were raining and thundering outside. The sound of the rain and thunder can mask the moans and movement of zombies, and depending on how dark it gets or how thick the rain cover is, could even hide them from you until you’re really close to them. It could also make the roads slick and thus travel by car a tad more treacherous. Thus far all we have to go on is the above concept art showing dark clouds in the distance and some scenes from the trailer where there’s cloud cover. No indication of rain yet, but where there are dark clouds, thunder, lightning, and rain are sure to follow... most of the time. One thing that frustrates me about State of Decay’s Breakdown mode is how, as soon as you establish a home base, the other two are destroyed by hordes and then they immediately start gunning for you as if a sixth sense is telling them exactly where to go. They won’t take any detours, they’ll just head straight for you and the game will let you know. If you aren’t prepared for an onslaught with barely any equipment to fight them off, a character will likely die, probably yours. That will stop the hordes, but at a cost. Of course, the easy way out is to grab a vehicle and just run all the hordes down. That’s a surefire way to live through it. Afterwords you can go about surviving the old-fashioned way, but players shouldn’t have to deal with that as soon as the game starts. It’s annoying to have to deal with it every, single, time. Delay the first wave of hordes so that the player can actually attempt to put up a resistance. Or better yet, don’t make the zombies omnipotent. I’d much rather go out and try to take out infestations in order to prevent hordes from becoming too numerous and attacking my base camp. 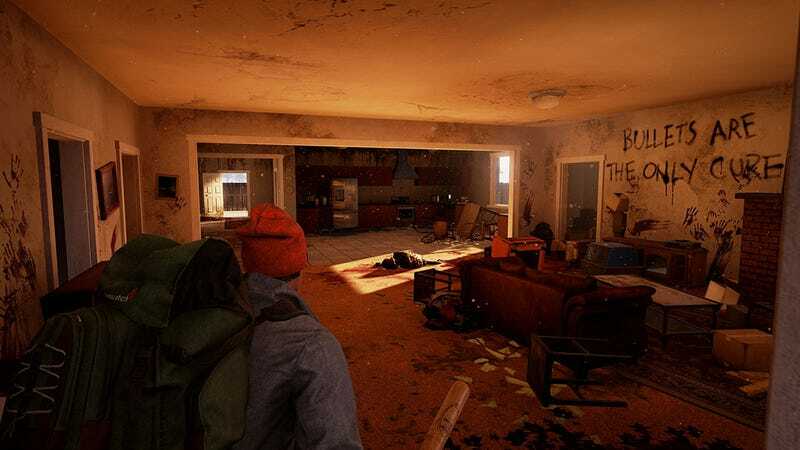 In State of Decay you have to set up a base camp which will act as your home. Your base will always be one of a couple pre-designated areas and I have a feeling that State of Decay 2 will be no different. Each of these home bases has a barrier of some kind, whether it be a stone wall or a fence. Regardless of which it is, it almost always has barbed wire or something else on top of it. This should effectively stop zombies from coming over the walls, or at least slow them down and do damage. Instead, the zombies just completely ignore that part and pile over rather than trying to knock down the gate. It makes the barrier between you and them feel completely useless. One of the main facets of State of Decay’s gameplay is that of base building. You settle into an area and slowly build up your facilities and community. As you bring in more and more survivors, resources become stretched and some will threaten to leave simply because there aren’t enough beds for everyone. The solution would be to build more beds, but you have such limited space that that just isn’t possible and there are only so many places you can go to grow. The best solution to this problem would be to create off-shoots of your community. Instead of setting up outposts that no one occupies, set up forward bases that act as branches of your community so that it doesn’t get claustrophobic and there’s enough space for everyone. And if the game has a system where other communities can turn hostile against you, make it so these branches can break off from you completely. State of Decay 2 can be played alone if you want too, but Undead Labs is going ahead and adding in drop-in/drop-out co-op for up to 4 players. My hope is that this isn’t just limited to have a friend jump in to help you out. I want to jointly run a settlement with my friends, kind of like setting up a tribe in Ark: Survival Evolved where players would band together, set up a base, and make runs for food and materials to sustain themselves and grow larger. This is what I want from the co-op of State of Decay 2. I don’t mind dropping in to help out, but I also want a more perpetual experience where we share a world and cooperate and survive together rather than just jumping in and out of each others games. Hordes in the original State of Decay are small. You’ll find more zombies at an infestation site than you will wandering around as a horde. Hordes are more like patrols because they walk up and down the streets with a line of sight indicator. I’m not a big fan of that approach and when a horde actually attacks your base there aren’t a bajillion of them, it’s just a small group of 5 to 7 zombies. You can fight them off on your own if you try hard enough. It’s when two or three hordes join together that they actually become a serious threat. I want that to be the norm, where hordes are far larger, numbering in the double digits. Make them a constant threat that you might not be able to take out just by running them over with the first vehicle you find.